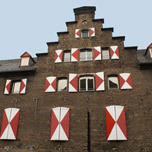 Please Note LatLon: Tour-Agentur is a guides agency who works independently from LatLon-Europe. 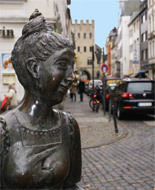 Please contact her directly to book your guided tour of Cologne. We wish you a great vacation! You have very little time, but you want to see the Cologne highlights? This walking tour takes you back to the origins of the city and shows you a bit of Roman feeling for luxury. Of course you will find out why the people of Cologne wanted to build the world’s highest church in the Middle Ages, but then stopped the construction process after 300 years. 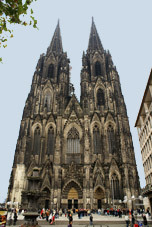 Furthermore, we will tell you how the Cathedral nevertheless was completed centuries later. Then you will get an impression of the bustling life in the narrow streets and passages of the old town. 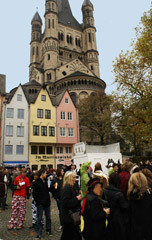 The walking tour “Cologne Highlights” takes 60 – 70 minutes. The gross price for a small group of maximum 7 persons in English is 90 € (including VAT), for a group up to 25 persons 110 € (including VAT). You are accompanied by a guide who was trained according to the directives of the German Association of Tourist Guides (BVGD). 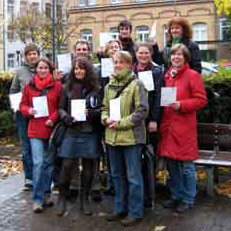 Many of our guides meet the European training standards for guides (DIN EN 15565) and have a BVGD certificate DIN EN. by e-mail info@tour-agentur.de or with online-form (LatLon-Cologne). 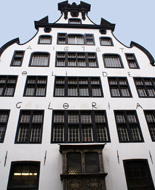 This walking tour gives you a feeling for Roman, medieval and contemporary Cologne. Discover the brilliant urban infrastructure of the Roman “Colonia Claudia Ara Agrippinensium” with its network of streets, its fresh water provision and its waste water disposal systems. 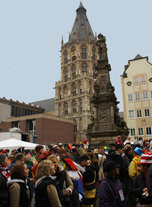 In the Middle Ages, the people of Cologne claimed to have as many churches as days in the year. 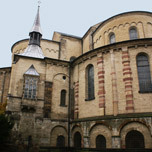 Many of them were demolished in the phase of secularisation in the early 19 th century, but twelve unique churches in the Romanesque style remain, and furthermore several Gothic churches, above all the Cathedral. Of course you will find out why the people of Cologne wanted to build the world’s highest church in the Middle Age, but stopped the construction process after 300 years. 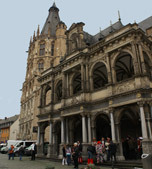 Furthermore, we will tell you how the Cathedral was nevertheless completed centuries later. Fortunately, the Cathedral survived the bombing of Cologne during World War II fairly well. After the war, the centre of Cologne was reconstructed rather hurriedly, but the narrow streets and passages of the old town still give you an impression of life as it was centuries ago. This guided tour takes 1,5 hour. The gross price for a small group of maximum 7 persons in English is 118 € (including VAT), for a group up to 15 persons 145 € (including VAT), for a group up to 25 persons 165 € (including VAT). 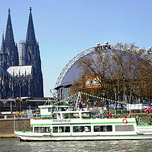 Additionally to the walking tour Cologne from A to Z, visits to the interior of Cologne sights can be arranged: the Cathedral, to the Praetorium (palace of the governors of the Roman emperors) with a part of the Roman sewer system, to the Roman-Germanic Museum or the Cologne Municipal Museum. 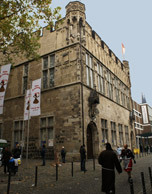 This combined guided tour takes 2 hours to 2,5 hours. The gross price for a small group of maximum 7 persons in English is 159 € (including VAT), for a group up to 15 persons 190 €, for a group up to 25 persons 210 € (including VAT). The Roman - Germanic Museum - Pure luxury!